$4.95 Shipping All Additional Cartridges Ship for $1.00! 2 YEAR WARRANTY AGAINST LEAKS! 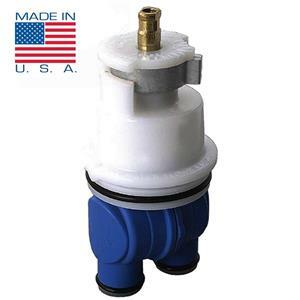 This brand new shower cartridge for Delta RP19804 1300 / 1400 faucets prior to 2008 is a perfect replacement for Delta's single handle tub faucet and shower valves. This shower cartridge is pressure balanced for a consistent water temperature, and installs easily without the need to go into the wall. Made in the USA! We know you need it quickly and will promptly ship your order within 24 hours of payment. Making and keeping our customers happy is our #1 priority. We pride ourselves with great quality, great shipping, and great customer service. You can bid with confidence knowing we'll be here to help with any questions you may have or advice you may need. Your satisfaction is our business! Please contact us with any questions or requests. We're here to help!